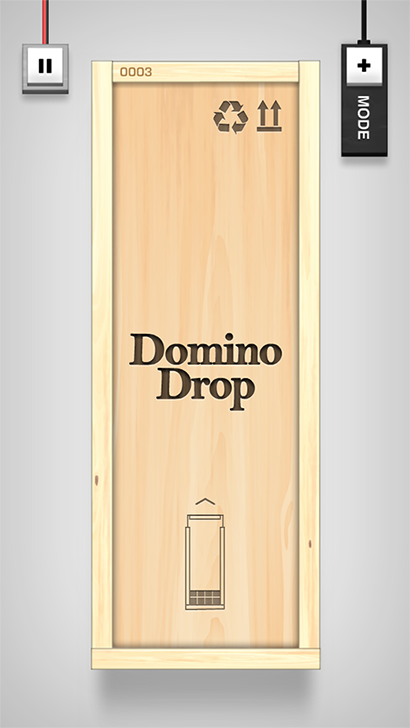 David Cole, Loyal Blog Follower, told me about Domino Drop, a point scoring puzzle game. Since the early 80's I've never like Tetris and Domino Drop reminds me of it. However, it's very different. The objective is to match 2 or more tiles to score points. Of course, those tiles disappear. Scoring System: if you get 2 tiles of any number, you'll score 100 points for each tile. But it gets more interesting. Pay attention here: if you get a chain reaction, the points will accumulate exponentially. Look at the second to last image. That came from a game I was playing. I moved the 4/5 to the third column. The 4's gave me 200 points (100 each). Ho hum. The subsequent 5's gave me 1000 points (500 each). Hmmm. When the 5's disappeared, it freed the 6. The 6's gave me 2000 points (1000 each). Oh Yeah. When the bottom 6 disappeared, it freed the 2. The 2's gave me 4000 points (2000 each). Now we're talking. That freed up the 4 in the 3rd column. The 4's then yielded 8000 points (4000 each). Wow. Total: 19,200 points for one move. Examine the last photo to see the final result of that one move. My high score is 133,800 which places me at 709 out of 18,000 players. As with most point scoring puzzle app games, there is an element of luck. http://dominodrop.com/ Watch the demo video. Cicada 3301 - what is it?